Sorbitol Can Be so "Irritable"
Yesterday while doing our grocery shopping, I got the urge to buy some fruit jelly jubs. I thought this would be a great snack for later on in the day. I was surprised when I read the label and it said “sugar free” and I thought I would try this alternative as I know how sweet these candies can get. The label did say “made with sorbitol” and I thought this is only a sweetener and there is nothing wrong with it. Later that day, I began to eat my new found sugar free snack and was enjoying my bag. Now you should know that I have a hard time just stopping at one candy, and I pretty much finished the bag. As is with my usual weekend custom, I took a nap only to be awoken up an hour later with the worst stomach ach I have experienced in some time. I had felt that I had completed over 100 sit-ups and the muscles on my abs were hard as a rock. Not only was my stomach in knots, but I began to feel that I was being inflated. Of course all these symptoms were only enhanced by the worst case of diarrhea I have ever experienced. Yes folks a wonderful case of irritable bowel syndrome. Yeah I know this isn’t what you want to read, but I felt I should warn people of this. There were no warning labels on the candy that eating excessive amounts of sorbitol would result in bowel movements that can continue for over a day. So be warned good people, sorbitol is BAD!!! Granted eating too much of a “good thing” can cause some bad things to happen. Lesson learned! It’s not a great way to loose extra pounds, granted it’s a quick way! Just the not most pleasant way! 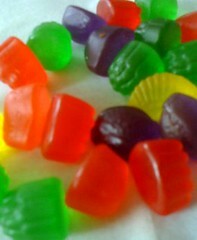 I miss eating jubjubs! Yum! I accidentally bought a bag of sorbitol sweetened chocolate covered nuts. It was a long long long long night. Previous PostPrevious Happy Canada Day-eh!